4100 kHz USB and 4101.4 kHz CW sounds like they were just flipping the mode switch from USB to CW! I've noticed that a lot of these marine users like to operate "between channels" for whatever reason....especially when HF-SSB marine gear comes with the ITU MF and HF marine channels pre-programmed in. The switching between SSB voice and CW is interesting though. Sounds like these ships actually have trained radio operators that know Morse enough to casually switch between it and regular voice comms for casual QSOing. It would be interesting if someone could translate the Korean. It seems like they are very familiar and informal with each other: laughing, joking, telling stories, and sometimes ranting like other peskies. They have a regular sked at 0530 UTC, and they can be copied sending Vs on CW a few times right before the sked, to tune their autotuners. 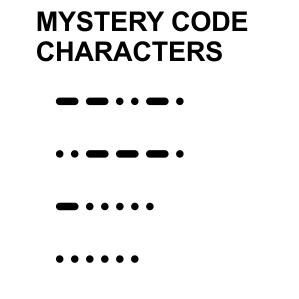 Their CW code is really more of a mystery. It seems a bit like Japanese Wabun (Kana) Code, but they aren't speaking Japanese on voice. There are some Wabun-like characters in it though. Waterfall image showing the UNID Peskies CW and USB Voice, surrounded by beacons. Report 0550UTC 2018 OCT 11. The 4100kHz 0530UTC sked peskies are a group of South Korean tuna fishing vessels that have been operating drifting tuna long lines in the mid-Pacific, including the equatorial area south of Hawaii. They are owned by the big South Korean fishing conglomerate corporation Sajo Oryang, which is on the Greenpeace Blacklist of irresponsible fishing operators. This is likely one of the reasons why they are using a non-standard maritime channel and talking in Korean mystery code. The other reason for their mystery code is probably competition from other Asian fishing fleets. 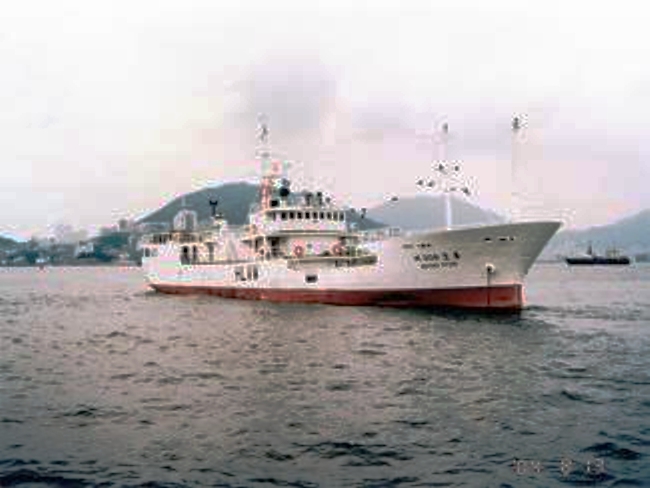 Sajo is the largest fishing company in Korea and the 3rd largest fishing company in the world, with 7 purse seiners, 79 long-liners and 2 motherships operating in the Pacific. Some of Sajo's fishing vessels have been caught in illegal activities. There were 3 stations on the air for their sked today, and one could be heard calling "Oryong, Oryong" just before the sked started. 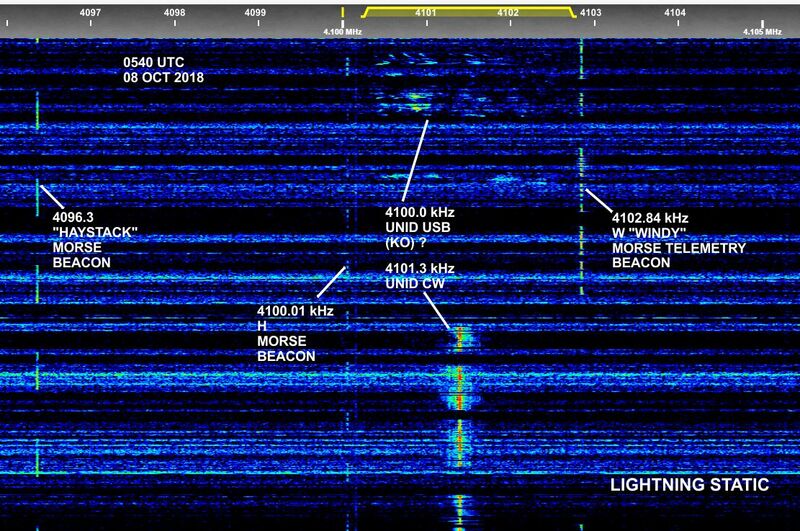 Copying their CW exchange, one of the stronger stations used the ID "DE HLVW"
I imagine the use of "secret codes" for communications on HF and the use of a "non-standard" frequency 4100 kHz within the 4 MHz marine band (between ITU HF SSB channel 412 - 4098 kHz and ITU HF SSB channel 413 - 4101 kHz) is less because the fishery they work for is involved in ecologically irresponsible fishing practices and more because they know that other fishing fleets, companies, private ship operators and all sorts of other people with HF radios are listening in. Fishing is a competitive business and I know in the Pacific its pretty crazy. This is probably also the rationale of the various Portuguese speaking, Spanish speaking and even English speaking fishing fleet communications heard on weird frequencies across HF (looking at you, Gloucester fishermen operating on 6095 kHz and 6952 kHz/6953 kHz, Brazilian fishing fleets using frequencies all over the 43 meter band, and lots of others)....they don't want their competition to be able to find them easily. I know that most HF-SSB marine radios come with the standardized ITU channel plan programmed in and likely come with a scan function so using an "in-between" or "offset" frequency plus switching back and forth from SSB voice and CW with a weird Morse alphabet would at least discourage some casual interception attempts. 4111.0 kHz USB voice and 4112.3 kHz CW - S. Korean peskies, Korean language, Korean CW code, good readable. It appears to be basically the same group of Sajo Oryong peskies also heard on 4100.0 USB and 4101.3 CW at 0530UTC. 4189.0 CW S. Korean peskies, Korean CW code, message traffic, good readable. Still using non-standard channels but since the ITU channels are 3 kHz steps, if they keep going up by 11 kHz they'll eventually end up on a legit channel. A lot of the marine communications I've heard in the 6 MHz band have been offset and between ITU channels too so I wonder if they're more like "guidelines" when it comes to de facto HF-SSB marine operating. The obvious exceptions being coast guard/emergency/DSC and weather or meteo broadcasts. These fisheries present a very interesting monitoring target. Here on the East Coast we have North, Central and South American fisheries mixing in with large numbers of freebanders and land-based stations coming out of Latin America (although US-based fishing fleets are also often heard on weird frequencies and within the legal marine bands). That doesn't include the presumably extensive use of high-HF (25-30 MHz) frequencies for fishery radio - I know Japan has two marine bands in the 26-27 MHz region, including 1W DSB Fishery Radio (1 watt carrier power AM mode) using odd 8 kHz channel steps from 26760 kHz to 26944 kHz, 27016 kHz, then again from 27524 kHz to 27988 kHz. In addition to the 1W DSB Fishery Radio service they have 25W SSB Fishery Radio (J3E emission only by Japanese law) from 27310.5 kHz to 27470.5 kHz in odd steps. Australia has their 27 MHz marine service from 27680 kHz to 27980 kHz (4 watts AM carrier power) and South Korea (Republic of Korea) has a similar AM fishery radio service on 27 MHz from 27508 kHz to 27943 kHz (again using odd channel steps and overlapping with the Japanese 27 MHz marine fishery radio band). Given the favorable propagation characteristics of 11 meters over water, I imagine these services are quite popular. I know JRC makes high-end equipment for both the 1W DSB frequencies and 25W SSB frequencies for fishery radio use in Japan. Since you're on the West Coast you have the Americas and Asia as monitoring targets and I'm sure there's a huge amount of HF maritime traffic coming out of Asia. Let's see if these guys change frequency again and there might be a set schedule they go by. Here on the west coast we hear tons of peskies in the Pacific and Bering Sea areas. There some local peskies on 5 MHz or 6 MHz non-maritime freqs, who are Canadians and NorthWest coast Americans (obvious accents). The sound of engines can often be heard running in the background when they talk, which is evidence that they are mostly smaller vessels or crabbers. Then there are peskies who are obviously Mexican, Central American, and South American, each with their different flavors of Espanol. The biggest HF active group of peskies are Koreans. There are Japanese peskies also, but usually they are on ITU marine channels. There are Chinese language (Mandarin and Cantonese, and other various forms). Indonesian languages are heard a lot around 10 MHz late at night, HF radio is really popular there. But most of the Indonesians that are heard are probably in the general vicinity of Indonesia. We often copy the peskies' drift buoy beacons on CW around 2 MHz and in the 26 to 28 MHz range. Drift buoy beacons in some seasons used to be like herds of rodents on 2 MHz. But more recently, they've been using the GPS buoys which don't transmit so often, and just send their position occasionally. The GPS buoys are probably why the CW buoys are diminishing, because they don't have to RDF the GPS buoys. The Japanese and S.Korean 27 MHz fishery allocations in the 11m CB spectrum were once upon a time popular for the local fishing, fish farm, or seaweed farming using walkie talkies. Probably, the wide availability of cheap VHF/UHF and marine HTs (and cellular) has pretty much replaced the 11 metre use in those areas. Today, while checking to see if Mix Radio was still on the air, some more S.Korean peskies were logged (probably Sajo Oryang again). 6868.0 USB voice, peskies, S.Korean language, moderately readable, strong lightning static. I imagine the fishing and crabbing boats in the Bering Sea offer some interesting radio chatter, considering the remoteness of that area. Ever hear any Russian language? I've messed around with KiwiSDRs located in various parts of European and Asiatic Russia and have heard all kinds of random HF traffic - some of it likely military but some of it certainly not. Lots of AM voice traffic in the 2-4 MHz region in addition to the FM CB traffic in the 25-30 MHz region.